Lectures will begin at 4 p.m. in the 18th Avenue Library (second floor, Music/Dance Library, Room 205), 175 West 18th Ave., unless otherwise noted. These events are FREE and open to the public. Campus visitors, please use the Tuttle Park Place Garage or the Ohio Union South Garage. All other garages in the vicinity of the 18th Ave. Library are closed to visitors before 4 p.m.
February 4 • “Maybe If I’d Stayed”: Appalachian Outmigration, Narratives of Loss, and Nate May’s Dust in the Bottomland. Travis Stimeling, West Virginia University. This lecture is co-sponsored by University Libraries and the Center for Folklore Studies. In a Woman’s Voice: Musical Readings by Women Composers, a lecture-recital. Marian Wilson Kimber and Natalie Landowski. This lecture, funded by the College, is sponsored by The William A. Hammond Lecture on the American Tradition. February 25 • Distant Reading as Process: On the Use (and Misuse) of Corpus Studies. Daniel Shanahan, theory/music cognition, The Ohio State University School of Music. March 4 • Mahler's Symphonic Modelings of Death. Arved Ashby, musicology, The Ohio State University. March 18 • How Does Music Feel? Tactile Listening from Sound Art to Live Performance. Ivan Raykoff, Eugene Lang College for Liberal Arts at The New School, New York. April 1 • Forgetting Out Loud: Musical Flag Convoys and Affective Non-Memorials of Violence at Croatian Weddings. Ian MacMillen, Oberlin College & Conservatory. April 15 • How Does Music Change our Experience of Time and Space? Yong Jeon Cheong, doctoral candidate in cognitive ethnomusicology, The Ohio State University. See also Reprise Lectures in Music, offered on Wednesdays during spring semester. 9/24/18: Ring-a-ding-ding: Performance Styles in the Movies and Music of Frank Sinatra. Dana Polan, New York University. This lecture is co-sponsored by the Department of Comparative Studies. 10/1/18: Transnationalism Comes Home: UNESCO, USIA, and Women's Advocacy for Music. Danielle Fosler-Lussier, The Ohio State University. 10/8/18: Blasting the Heritage Corner: Arab-Jewish Slam Poetry and the Performance of Resistance in Israel. Michal Raizen, Ohio Wesleyan University. This lecture is co-sponsored by the Department of Near Eastern Languages and Cultures. 10/22/18: The Musical World of Jean Gerson (1363–1429). Graeme Boone, The Ohio State University. 10/29/18: The Sounds of Equity and Inclusion: Hip-Hop in Brazil and Beyond It. Dave McLaughlin, The Ohio State University. This lecture is co-sponsored by the Department of Spanish and Portuguese. 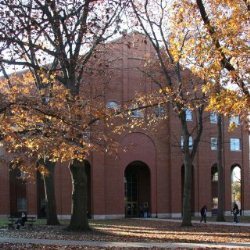 11/14/18: Annual William Poland Lecture, hosted by the Music Theory area. Mimesis, Meaning, and Music. Lawrence Zbikowski, University of Chicago.